Photographer's notes: "Back to a Coast Guard assault transport comes this Marine after two days and nights of Hell on the beach of Eniwetok in the Marshall Islands. His face is grimy with coral dust but the light of battle stays in his eyes." Select from the photographs below for more images. The photographic documentation of war began soon after the camera's invention. In 1855, Englishman Roger Fenton packed a wagon with photographic equipment and set out to cover the Crimean War. Although precedent-setting, his carefully posed images of British camp life failed to capture the drama and horror of war - no dead bodies, no mass destruction. This was in part due to the handicaps of his equipment and to the goal of his royal patrons to portray the war in the best light possible. A few years later, the photographers of the American Civil War hauled their bulky equipment onto the battlefield to capture war's grisly aftermath. Their images - fields filled with the bloating bodies of the dead - caused a public sensation. Their groundbreaking efforts however, can be more appropriately described as battlefield rather than combat photography. The technical limitations of their equipment prevented them from catching the action of war. Armed with faster film, smaller cameras and no longer needing to haul a darkroom behind him, the World War I photographer could get closer to combat. The introduction of 35mm film increased the intimacy of the camera's eye, enabling the World War II photographer to become part of the action. Television changed perspectives again - the war in Vietnam literally entered the living rooms of millions of Americans each night. Today, with the introduction of satellite connections, our images of war are not only in our living room but they are instantaneous and live. Although the camera has changed our impression of war, the reality of war remains the same. 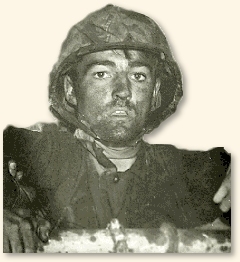 As the Marine to the left wearily clamors over the ship's guardrail, his expression reveals the horrors that have been war's companion since the beginning of time. "Combat Photography, 1918-1971," EyeWitness to History, www.eyewitnesstohistory.com (2000).